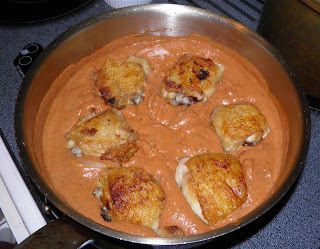 Butter chicken was not a traditional homemade meal, but the invention of a restauranteur. This is an Indian restaurant classic. I paused when I typed in the title "homemade," because it was never a homemade dish. Pair that with a recipe that has no butter in it and you have double confusion. This is also a repeat posting (I have a craving...). But what a repeat. This is one of the best Indian-style dished in my repertoire. Seriously. 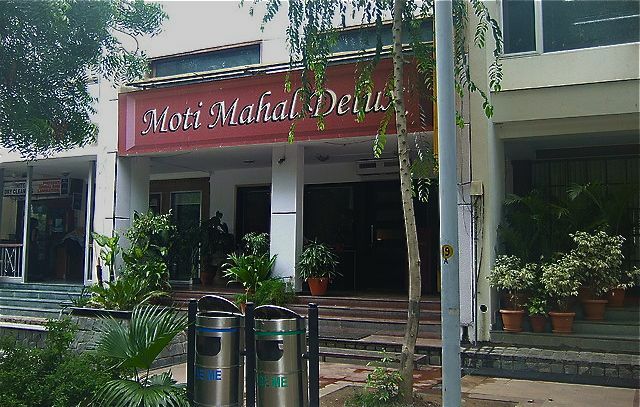 Moti Mahal is now a chain of restaurants. This is one. 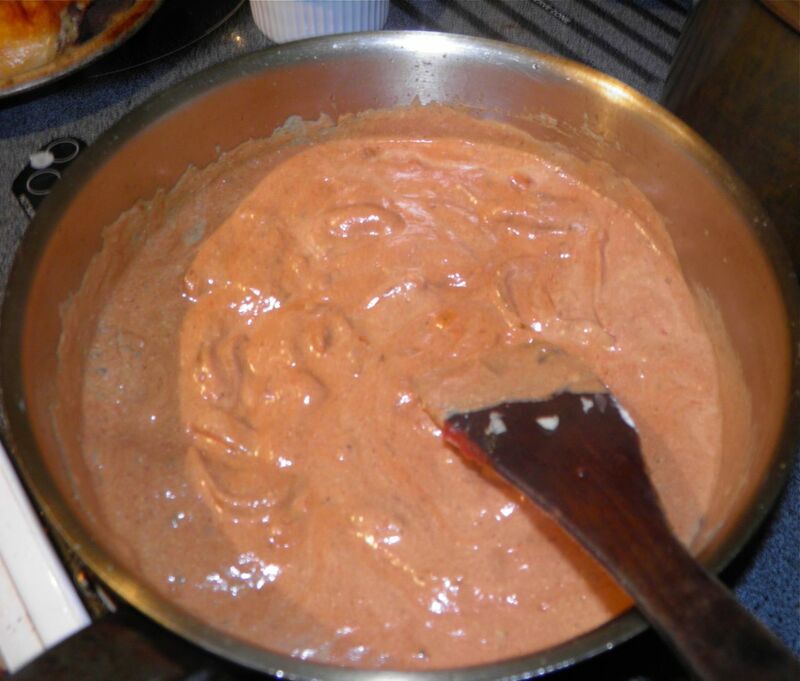 Butter chicken, or Murgh Makhani, is an Indian dish that is now popular all over the world. The recipe, created in the late first half of the 1900s, can be traced back to a restaurant in the Indian capital of Delhi. 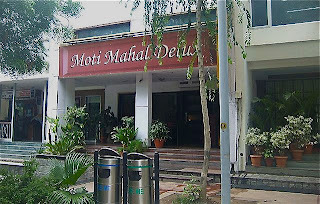 According to a documentary on the Discovery Channel, butter chicken originated in a famous restaurant named Moti Mahal Delux in central Delhi, India. The owner, Kundan Lal Gujral, is famous for inventing another "classic", tandoori chicken, as well as several other Indian dishes, including butter chicken and dal makhani. "Makhani" is a Hindustani word meaning "with butter." His restaurant recycled the leftover juices from making tandoori chicken as a base for a marinade, and added butter and tomato to the mix. A tandoor is a cylindrical clay oven originally used in Northern India and Pakistan for both cooking and baking. It's interesting that two of the most world famous Indian dishes didn't have their start in country kitchens, but in the kitchen of a restaurant. 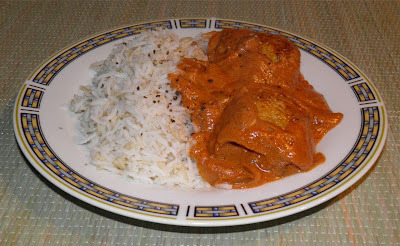 Butter chicken uses either cubed or bone-in chicken and can have a wide variety of spices often including cumin, cloves, cinnamon, coriander, pepper and fenugreek. It nearly always has yoghurt, cream and tomato paste. There are as many versions of butter chicken as there are cooks. I hope you like mine. It is very tasty and as far as making Indian food "from scratch" is a breeze! This one is "Cyn-endorsed" – a friend of mine from where I used to work. This is the sauce just after all is combined in the pot. Place the chicken thighs in a large low saucepan. Season with salt and pepper and fry both sides until golden but not completely cooked, about 10-15. This will depend on the size of your chicken thighs. as the dish simmers. Compare this with the top photo. Remove the thighs to a plate and drain off all but 1 tbsp of the collected chicken fat. Peel and halve the onions. Then take each half and cut from top to bottom to make long slices. Add the onions and chopped ginger to the pan and cook until just beginning to soften. Add the garlic and cook for a further 2 minutes. Then add the cayenne, cumin, bay leaf, cinnamon and cardamon and cook for 1 more minute. Stir in the coffee cream and then the yogurt. Mix well. Then add in the tomato purée and lemon juice. Mix well and bring to a simmer. Nestle the chicken pieces into the sauce, cover and let cook while you make the basmati rice. The rice will take about 25 minutes. Bring the salt and water to a boil. Add the basmati, stir and cover. Reduce heat to simmer and let cook for 15 minutes (17 minutes for brown basmati). After the water has been absorbed, remove from the heat and let sit for 5 minutes. Serve the chicken and sauce beside the rice.